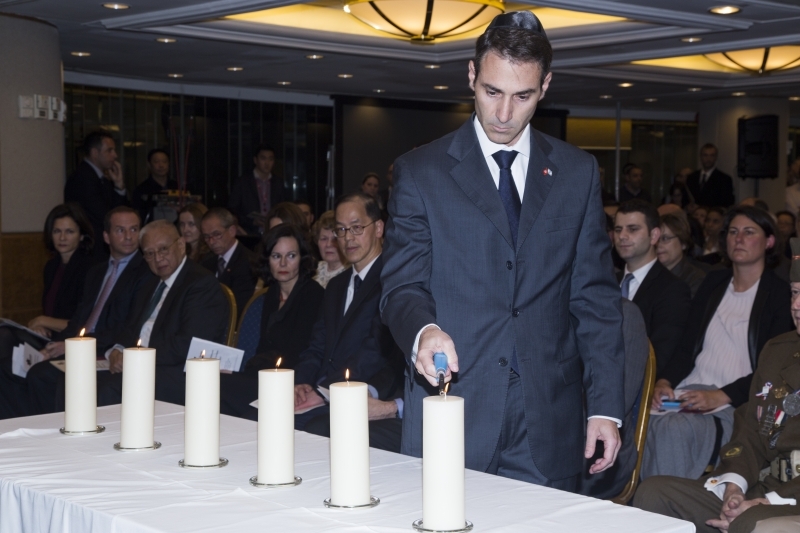 On the 70th anniversary of the liberation of Auschwitz-Birkenau, the HKHTC marked 2015 International Holocaust Remembrance Day with a special programme co-sponsored by the United States Consulate in Hong Kong and Macau. Some 400 Jewish and local community members were in attendance, as were 30 diploamts and dignitaries, including The Hon. Tung Chee-hwa, former Chief Executive of Hong Kong and The Hon. Tsang Tak-sing, HKSAR Secretary for Home Affairs. The keynote speech was delivered by retired US Army Sergeant Rick Carrier, veteran of the Normandy landings and a liberator of the Buchenwald concentration camp. The ceremony was followed by the Hong Kong premiere of Night Will Fall (co-sponsored by the Hong Kong Jewish Film Festival) an as yet unreleased film documenting the liberation of the concentration camps—overseen by Alfred Hitchcock. The event was covered by the South China Morning Post and appeared on the front page of the newspaper the next day, on January 28th.